Crude oil traded near a one-week low in New York on an unexpected increase in U.S. supplies as imports jumped to the highest level in almost four years. Oil dropped 0.7 percent yesterday after an Energy Department report showed crude inventories climbed 7.31 million barrels to 360.8 million in the week ended July 23, the biggest gain since March 19. Analysts in a Bloomberg News survey had forecast stockpiles would tumble to a four-month low. Imports climbed to the highest level since August 2006. Crude oil for September delivery was at $76.95 a barrel, down 4 cents, in electronic trading on the New York Mercantile Exchange at 9:37 a.m. Singapore time. Yesterday, the contract fell 51 cents to $76.99. Futures have dropped 3.1 percent so far this year. Imports rose 1.18 million barrels, or 12 percent, to 11.2 million, the highest level since the week ended Aug. 25, 2006. Crude oil supplies were forecast to decline 1.73 million barrels, according to the 16 analysts in the Bloomberg survey. Oil prices also fell yesterday after total orders for durable goods, those meant to last at least three years, unexpectedly dropped 1 percent amid a slump in demand for aircraft. The Commerce Department report deepened concern that the economic recovery may be flagging and limiting fuel demand. Economists forecast total durable goods orders would climb 1 percent, according to the median of 76 projections in a Bloomberg News survey. The Commerce Department revised May’s decline to 0.8 percent from the previously reported 0.6 percent. Brent crude for September settlement traded at $75.86 a barrel, down 20 cents, on the London-based ICE Futures Europe exchange at 9:11 a.m. Singapore time. Yesterday, the contract fell 7 cents, or 0.1 percent, to settle at $76.06. Gold may advance for a second day on speculation the metal’s prices near a three-month low will help shore up demand. Gold for immediate delivery traded little changed at $1,165.15 an ounce at 8:38 a.m. in Singapore. December-delivery futures rose 0.5 percent. “The correction phase of gold is about to be completed and the market will see some period of consolidation near this or a slightly lower level until next week,” said Wallace Ng, executive director with ABN Amro NV in Hong Kong. Bullion, which touched a record $1,265.30 on June 21, has since slumped 8 percent and fell as low as $1,157.03 this week, the lowest since April 27, as a rally in global equities curbed demand for bullion. Asian stocks have climbed 5.7 percent in July, snapping a two-month decline, while gold fell 6.2 percent, the first monthly decline since March, as investors reduced holdings of safer assets in search of higher returns. Gold holdings in the SPDR Gold Trust, the biggest exchange- traded fund backed by bullion, fell for a third day yesterday. Assets under management have dropped 2.9 percent this month. Physical demand for gold from India, China and the wider Asian region was “very visible” as gold prices declined this week, UBS AG analyst Edel Tully said yesterday. Still, physical demand isn’t sufficient to prop up the price and the short-term outlook was “increasingly murky,” she said. “Few investors are likely to add to their long gold exposure down here, afraid of catching a falling knife, until some sense of stability is restored to price direction,” London-based Tully said in a report. Silver increased 0.5 percent to $17.555 an ounce, platinum added 0.2 percent to $1,542.50 an ounce and palladium advanced 0.4 percent to $471.25 an ounce. Oil fell for a second day in New York after an industry report showed U.S. crude inventories rose and the Conference Board said confidence among the nation’s consumers fell, signaling growth and energy demand may falter. Oil dropped the most in more than three weeks yesterday as the confidence index declined to the lowest level in five months. The gauge was at 50.4 from a revised 54.3 in June, the New York- based private research group showed. It was forecast to drop to 51, according to a Bloomberg News survey. Crude supplies rose by 3.08 million barrels, the American Petroleum Institute said. Crude oil for September delivery dropped as much as 62 cents, or 0.8 percent, to $76.88 a barrel in electronic trading on the New York Mercantile Exchange. It was at $77.13 at 10:15 a.m. Sydney time. Yesterday, the contract fell $1.48, or 1.9 percent, to $77.50. Futures have declined 3 percent since the start of the year. U.S. crude oil inventories rose to 356.3 million, the Petroleum Institute said yesterday. Gasoline stockpiles climbed 877,000 barrels to 222.3 million, the report showed. A government report today may show U.S. oil inventories dropped to a four-month low, according to a Bloomberg News survey. U.S. stockpiles probably fell 1.73 million barrels in the seven days ended July 23 from 353.5 million the week earlier, according to analysts surveyed by Bloomberg. Gasoline demand rose 1.7 percent last week, as U.S. motorists bought an average 9.51 million barrels a day of the motor fuel in the week ended July 23, according to MasterCard Inc.’s SpendingPulse report yesterday. The gain was the second in a row and the sixth in seven weeks. Oil touched $79.69 a barrel in intraday trading yesterday, the highest level since May 6, as global equities gained before the consumer confidence report. Estimates for consumer confidence ranged from 46 to 55.5 in the Bloomberg survey of 73 economists after a previously reported 52.9 reading in June. The Conference Board measure averaged 98 during the expansion that ended in December 2007. Brent crude for September settlement fell 28 cents, or 0.4 percent, to $75.85 a barrel on London’s ICE Futures Europe exchange at 10:25 a.m. Sydney time. Yesterday the contract fell $1.37, or 1.8 percent, to settle at $76.13. FCPO 3rd month Oct futures contract traded RM12 higher to close at RM2485 levels as compare to previous trading sessions with a total of 10,381 lots traded in the market. FCPO price traded higher after long consolidation around support levels despite soybean oil and crude oil were traded in contradicting direction during electronic trading sessions. FCPO price found temporary support at RM2434; 38.2% Fibonacci support regions, before begin surge higher and settled at RM2485; 50% Fibonacci resistance levels. Technically, FCPO price currently seems crucial in determining if FCPO would further undergo correction phase or resume bull rally in the coming trading sessions where critical resistance levels were seen RM2497 and RM2520 regions while support levels remain at RM2402 and RM2371; both are 50% and 61.8% Fibonacci support levels. FKLI July Futures contract traded 0.5 points higher to close at 1355.5 levels as compare to previous trading session to with a total of 11,143 lots traded in the market. FKLI opened higher for trading but only manage to settle 0.5 point higher due to massive profit taking activities despite regional indices were traded higher during trading sessions. 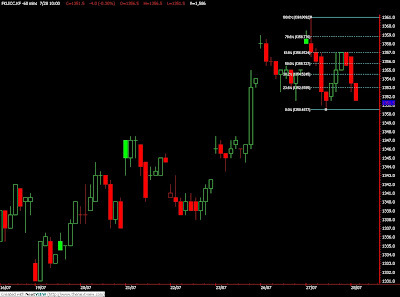 FKLI fall after attempt to penetrate resistance levels at 1361 regions failed in the morning trading sessions before start to engage to find support at 1351 regions. However, FKLI manage to recover some losing ground towards 1357 region, 61.8% Fibonacci resistance levels regions. 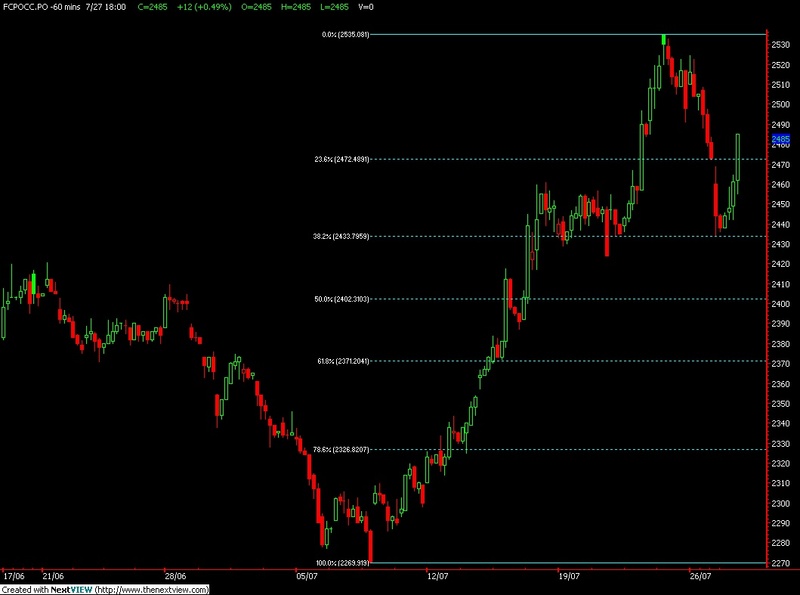 Technically, FKLI seems manage to rebound 61.8% Fibonacci figure after manage to penetrate 0.5 point below support levels at 1351. FKLI would expect to trade lower in the coming trading sessions provided resistance levels at 1357 and 1363 were not violated in the coming trading sessions. 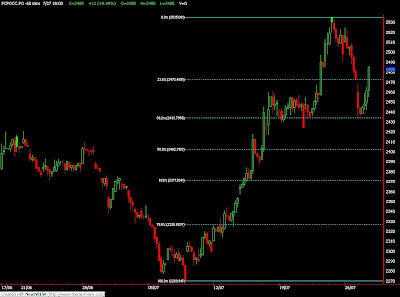 Support levels were seen at 1343.5 and 1338 regions. Crude oil traded near $79 a barrel in New York after dropping from an 11-week high as Tropical Storm Bonnie weakened and on concern that the pace of fuel demand recovery in the U.S. may falter. Oil declined as Bonnie degenerated to a “disorganized area of low pressure.” Prices also fell amid forecasts that the U.S. economy expanded at a slower pace in the second quarter. Gross domestic product rose at a 2.5 percent annual pace after increasing at a 2.7 percent rate in the first three months of the year, according to economists surveyed by Bloomberg News before a July 30 Commerce Department report. Crude oil for September delivery traded at $79.03 a barrel, up 5 cents, on the New York Mercantile Exchange at 9:35 a.m. Singapore time. The contract fell 32 cents, or 0.4 percent, to $78.98 on July 23 after reaching $79.30 on July 22, the highest close since May 5. Futures are up 16 percent from a year ago. Storms are closely watched in the Gulf, partly because they may topple oil production platforms and rupture pipelines. The Gulf accounts for about 31 percent of U.S. oil output and 10 percent of its natural-gas production, according to the Energy Department. The coast along Louisiana and Texas is home to 42 percent of U.S. refining capacity. Brent crude for September settlement traded at $77.69 a barrel, up 24 cents, on the London-based ICE Futures Europe exchange at 9:35 a.m. Singapore time. The contract dropped 37 cents, or 0.5 percent, to $77.45 on July 23.